Classes officially end on December 4 for University of Toronto students. With final examinations starting on December 9 and ending December 20, students are given five days to prepare for a two-week stretch of intense and stressful studying. Many on-campus organizations recognize the value of taking breaks to de-stress. Clubs such as the Arts & Science Student Union and University College Literary and Athletic Society are hosting pre-season events for students to relax and prepare themselves before the start of examinations. Other clubs believe that a change in a student’s study environment can be a great way for them to prepare for their tests and connect with other exhausted peers. Rooms all over campus, ranging from the Innis Residence Events Room to Woodsworth’s Kruger Hall, are being converted into open study spaces in preparation for exam season. The University of Toronto is offering a wide variety of exam de-stress and test preparation events. These events are free for all U of T students, and are a great way to relax or review for your exams this year. The Residence Events Room will convert into a 24-hour study space with hot beverages and healthy snacks for all students. This conversion will last the entire exam season. The Innis Exam Jam includes a host of recreational activities meant to help all University of Toronto students cope with exams, and opens up Innis Residence as a space for studying. University of Toronto Mississauga (UTM) will be holding a campus-wide Exam Jam. The event will feature instructor-led study sessions for subjects including biology, sociology, and linguistics. Seminars that focus on answering multiple-choice questions and writing essays and short answer questions will also be provided. The classes will be held across Mississauga campus. Class-specific details can be found on UTM Exam Jam’s Facebook page. The day-long event combines study-intensive review sessions with engaging activities that aim to maintain students’ mental health throughout the exam period. The faculty hopes that these events will establish healthy exam habits for years to come. The survival kits contain hot chocolate, candy canes, granola bars, pencils, pens, papers, and a few jokes for students. 10:00 am–6:00 pm, Newman Centre, 89 St. George Street. The Newman Centre will host additional study spaces with coffee and study snacks for students. These study spaces will be available Monday to Friday until the end of exam season. Exam season survival kits will also be available for pick up during these times. The Newman Centre Study Space provides a place where students can relax and spend time with their peers. 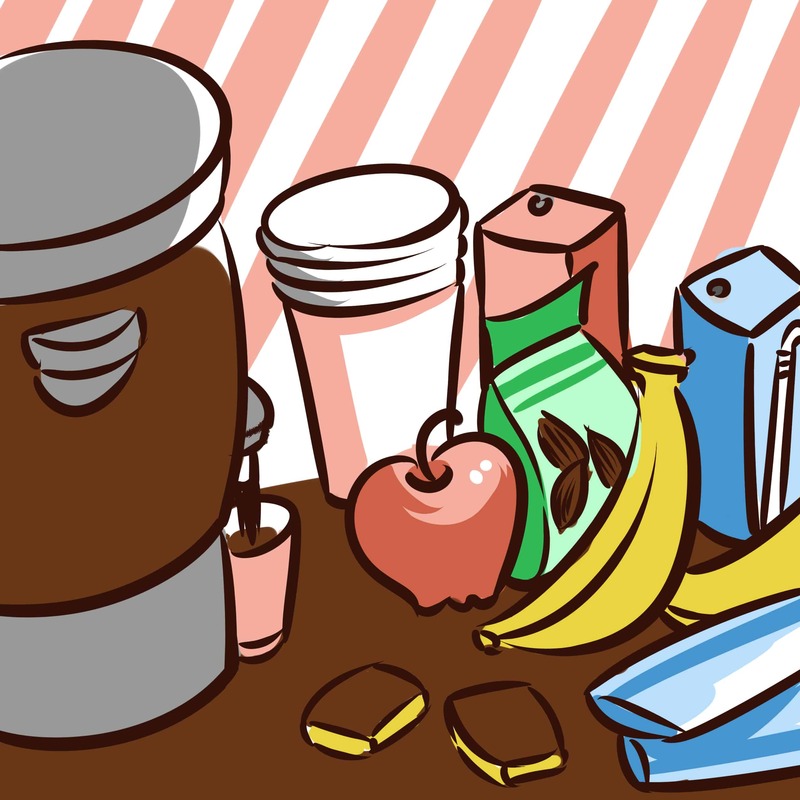 The food and survival kits are intended to assist students with the pressure of exam season. 12:00 pm-1:00 pm, 21 Sussex Avenue, Room 505. The MSA is offering drained students a space to enjoy tea, hot chocolate, and board games. The event is a way for Uof Tstudents to connect with the club’s executive members and to foster a closer sense of community in the MSA. With a good reception from students, the MSA is planning on making the de-stress hour a regular program throughout the spring semester. The office would be available each day of the week, and students would be able to regularly drop by for a hot drink and board games. 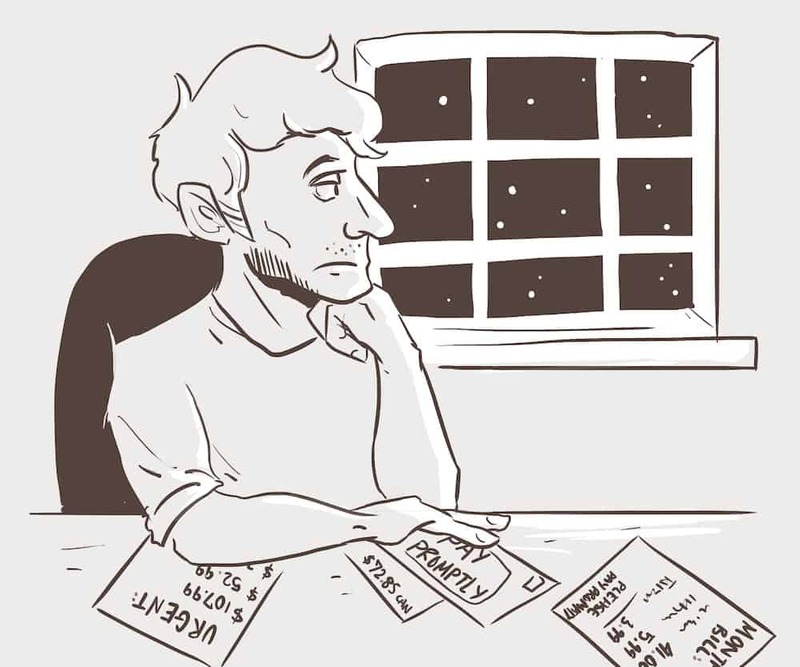 The Exam Jam: review, refresh, de-stress! The review sessions are instructor-led study groups, generally for large first- and second-year courses in the Faculty of Arts & Science. About 20 courses are being including several courses in economics, statistics, chemistry, and biology. The ASSU and other campus organizations are offering open exam prep spaces for students. These spaces are open to all students in all courses. Some study spaces are open at Woodsworth, Innis, and UC throughout the exam period. Over a dozen rooms in Sid Smith are available for studying between 10:00 am and 6:00 pm on Thursday, December 5. A plethora of free recreational activities are available for students in Sid Smith including free massages, pet therapy sessions, button making, and various free snacks and hot chocolate. Instructor-led review sessions are a great alternative to office hours for students who are struggling with difficult material. Relaxing activities provide a much-needed break for tired brains. This exam de-stressor is intended to provide students with a chance to relax with a free session of yoga and meditation, followed by food and an art session. Students are urged to bring their own yoga mats if they own one, but UCLit will provide a yoga mat for you if you do not. The yoga session will be led by Hayley Lowe, a Toronto based teacher who specializes in working with children. Yoga can boost students’ creativity and confidence, and can be a great physical activity during a study break. This free yoga session is designed to give students an opportunity to de-stress during exams. December 4: Woodsworth College Students’ Association Cram Jam! The Cram Jam will consist of open, quiet study space for all students with free snacks and light refreshments throughout the day. Students are free to study and snack as they wish throughout the day. The space provides an open and relaxing environment for students to catch up on their studies in time for the exam season. Many students living in residence will be required to leave their dorms for the winter break — from December 21 to January 5. Students living in the few residences on campus that allow students to stay during the break will be required to pay around $400. During the break, students planning on returning for the winter semester are permitted to leave all of their items in their dorm rooms, which will remain heated throughout the break. Those who elect to stay in residence will not have access to food or mail services, and often will have restricted porter’s office hours with few or no dons. Residents staying on campus during this time will also not be permitted to bring guests into their residence. University College, Trinity College, New College, and St. Michael’s College give students the option to stay on residence during the break. University College residents may pay $25 a day up to a total of $350 to stay during the break. St. Michael’s College also charges $25 a night, up to a total of $375 for the entire stay, with a limited custodial crew working. Nikki Butler, the coordinator of residence services at New College, says that only the 45 Willcocks residence is open over the winter break, and that an extra $400 is charged to students at the beginning of the semester. As a result, around 75 per cent of students at 45 Wilcocks stay in residence during the break. For students living on residence at other colleges who cannot find accommodations for the break, the university has released a housing form outlining nearby hostels and hotels ­— ranging from $25 to $150 a night. Michelle Verbrugghe, a representative for student housing at the Scarborough campus, says that the average cost for winter break residence is $250. Students at UTM face a similar predicament, and have demanded answers from the administration as to the reason behind these extra fees. Nengi Adoki, an international student at UTM, wrote an open letter published in The Medium that outlined her stance towards the extra fees. “As an international student, I pay on average at least $30,000 a year, which includes tuition and housing,” she wrote. Although students have repeatedly expressed their concerns to the UTM administration regarding this issue, winter break residence fees will not be changing this year. Every motion except one passed at the University of Toronto Students’ Union (UTSU) Annual General Meeting (AGM). While UTSU president Munib Sajjad called for student engagement and campus unity, some members of the union left disaffected when their grievances were not heard. Engineering society (EngSoc) director Pierre Harfouche motioned to remove items 2 to 10 from the agenda, after the Board of Directors ruled his motions out of order prior to the AGM. This sparked a procedural debate over the necessity of a motion to approve the agenda. “Robert’s Rules state that if an agenda is not approved, members can amend it by a majority,” argued Harfouche, referencing the rules of order to which UTSU AGM’s adhere. Ashkon Hashemi, the chair, defined the order of proceedings for the meeting as an order of business rather than an agenda — meaning that the motion needed a 2/3 majority motion to pass, rather than a simple majority. “What we have before us is an order of business, as specified by UTSU’s bylaws. If you want to change things, you can, but it’s a 2/3 majority motion,” stated Hashemi. The motion did not pass. 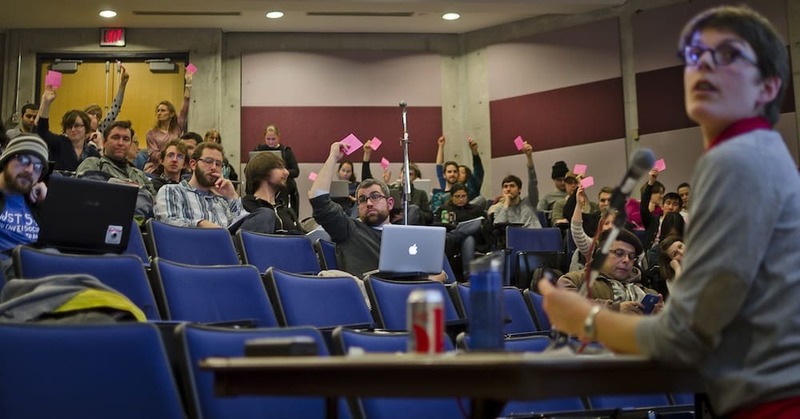 The order of proceedings distributed was titled “agenda,” was referred to as an agenda in documents leading up to the meeting, and an approval of the agenda vote has been at the UTSU AGM for at least the last three years. Harfouche has already submitted a motion for next year’s AGM that would allow a referendum to be held by the Faculty of Engineering to reduce its UTSU membership fee to $0.00. During question period, student Ryan Gomes asked how a $152,000 surplus became a deficit of $50,000 between the UTSU’s 2012 and 2013 audits. Gordon Lee, representative of Yale and Partners LLP, which conducted the audit, said that organizations like the UTSU should be focused on trying to get to “zero,” rather than turning a profit. “A $52,000 deficit on $13 million in revenue is very close to zero in my books,” said Lee. Despite students queuing up to discuss the audit, the first speaker called the question, putting it to an immediate vote. There was no discussion of the issue, and 480 members voted in favour of approving the financial statements to 205 opposed. Sajjad said he voted on the motion to call the question in order to keep the debate moving after earlier delays. “I was worried about people leaving. I wanted to get to the motions that affected the students’ union,” he said. Many members were dissatisfied with the rapid move to voting, and left the auditorium. Former St. George Round Table chair Scott Dallen was among those leaving the AGM. “They voted to stifle the debate on that issue; it just moved directly to a question. There’s no point in it,” he said. Nishi Kumar, president of the University College Literary and Athletic Society (UCLit), said that while the debate over procedure was unfortunate, it could improve the AGM in the future. “I hope that having seen this type of procedural understandings, students are better able to work within the system that is presented to them, and that next year’s meeting can be more efficient,” she said. In his opening remarks, Sajjad expressed a desire to engage students, unite them over the goal of affordable education, and avoid alienating the UTSU’s membership. “Tonight, you will have the opportunity to shape the future direction of the UTSU and ask us any questions you may have,” he said. Aidan Fishman, a student member of U of T’s Governing Council, tested that statement by raising the issue of fee diversion and defederation during the question-and-answer period following Sajjad’s speech. Fishman asked whether there was any circumstance under which the UTSU would amend its bylaws to permit defederation. “Cutting up the students’ union isn’t the way to go,” Sajjad said in response, pointing out that student societies can hold referenda to increase their membership fees if they would like to expand services. Sajjad’s absence at the Student Societies Summit was also addressed. Mary Stefanidis, president of the Innis College Student Society (ICSS), asked why the UTSU had not sent its president to the summit, and claimed that the UTSU was the only organization not to do so. The ICSS had voiced its concerns in a letter to the summit on November 15, criticizing the current UTSU representatives. The motions that were passed included the motion to amend the bylaws to comply with the Canada Not-For-Profit Corporations Act, which will no longer allow voting by proxy at board meetings; a motion to create an online forum for members to report issues and concerns to the UTSU; a motion to investigate the board and commission structure; and a motion endorsing the “Raise the Minimum Wage” campaign. While a number of colleges’ student representatives attended the AGM, Trinity College chose to abstain. Benjamin Crase, Co-head of College at Trinity, said that his group did not believe that the AGM fostered democratic debate, and encouraged to attend Trinity’s Christmas Dinner, which usually takes place on the last Wednesday of November. “As student leaders, we were not prepared to deceive our membership by telling them their voices would be heard at the AGM,” said Crase. “I think everyone has a voice at the general meeting,” said Sajjad, highlighting online voting as a reform implemented because of opinions voiced at an AGM. On Friday, November 28, a hearing involving Knightstone Capital Management, the City of Toronto, and a number of residents’ associations and local residents concluded at the Ontario Municipal Board (OMB). Knightstone, a private development company, appealed the OMB’s rejection of a a new University of Toronto student residence at the corner of College Street and Spadina Avenue. Originally proposed to be 42-storeys, the current residence plan is for 24-storeys. Concerns raised by the City and residents’ associations include that the building’s proposed size and scale are not appropriate for the area, as well as its relationship to U of T, and the legal rules under which it will operate. Unlike U of T’s other off-campus residences, like Chestnut Residence, the proposed residence at 245–255 College Street and 39–40 Glasgow Street would be built by Knightstone and managed by The Scion Group. Scion is a private company based out of the United States that manages student residences. 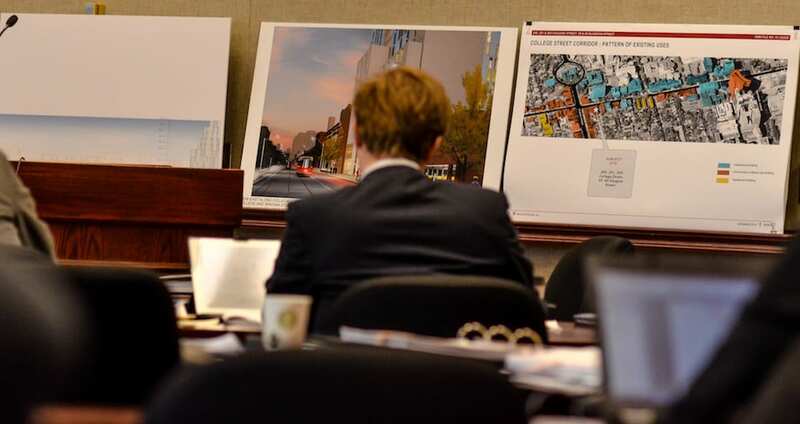 During the cross-examination of Eric Luskin, the vice-president of Scion, the opposing council raised concerns ranging from how much social space Scion would provide for students to how many loading docks they had in place for delivery trucks. Additional concerns included who is allowed to live in the building and how people can be evicted. Both Knightstone and Scion said that the sole purpose of the building is to house U of T students from a broad range of ages and programs, to accommodate an increasing need for student housing in the downtown core. However, because the site is off U of T property, U of T does not govern it. The building falls under the jurisdiction of the Residential Tenancies Act. This would make it difficult to evict individuals who are no longer students at the university, since they would be protected under this legislation. Furthermore, because the residence will be privately run, students from other universities may live in the building if there are rooms available. Local residents also asked who will inhabit the building in the summer, and if it will be run as a hotel. Luskin said that his company has an agreement with U of T to fill the building with U of T students, and to make the terms of the lease last for 12 months to avoid the issue of renting out rooms in the summer. Scion has not signed any contracts with U of T that outline these policies. Other concerns about the details of the residence — including the number of live-in staff, dons, and the operation of the cafeteria and security — were raised by the city and residents’ associations. Most details were not fully determined at the time of the trial. The exterior of the building was also discussed, which brought architects and city planners to the stand. They disagreed on whether the residence would fit into its surrounding area, as its location is designated “mixed-use.” David Bronskill, representative of Knightstone, described other buildings in the area of similar height to the residence, or taller. Residents expressed concern about the problems that a students residence might create in the neighbourhood. Furthermore, they were skeptical about the fact that a private company runs the project, claiming that its ultimate goal is to meet the company’s bottom line. Ceta Ramkhalawansingh, a representative from the Grange Community Association, said that residents would be okay with something eight to 12 storeys high, but that something of the proposed scale does not fit the area. During his closing remarks, Ray Kallio, representative of the city, asked the adjudicator to put less weight on the remarks of expert witnesses like Luskin — claiming that they contain inconsistencies. “Tall buildings don’t belong everywhere downtown,” he said, and asked the adjudicator to dismiss the appeal completely. “[This residence is the] most egregious development I have seen in this neighborhood in the last 40 years,” said Ramkhalawansingh in her closing remarks. “Another way residents have talked about this is this is a form of home-wrecking. To match up 829 students with the 50 Glasgow Street residents is a way of wrecking their homes. We don’t get it.” She urged the adjudicator to refuse the appeal. In a statement after his closing remarks, Kallio said: “I think the city and the residents put in a strong case to persuade the board not to approve it. We will wait for the decision to come out to see if there are any further steps.” Bronskill did not give any comments after the case. The decision of this case could set a precedent for other proposed buildings in the area. The final decision will be released within the next few weeks. Conflict continues to divide a major organization through which universities lobby the provincial and federal governments. The Canadian Federation of Students (CFS) has made no changes in reaction to protests outside their Annual General Meeting (AGM) by various student unions last week. Jonathan Mooney, secretary-general of the Post-Graduate Students’ Society of McGill, organized the protests. The Concordia Student Union and the Dawson Student Union also participated. The protests are just one episode of what has been a long, complicated conflict between the CFS and the aggrieved student unions. The organizations in question argue that the CFS’s practices are undemocratic, and that it has a history of silencing dissent. Feeling that the federation has not responded adequately to these allegations, the unions have launched efforts to decertify from it. Prior to the AGM, a number of students at CFS member universities, including the University of Toronto Graduate Students’ Union (GSU), had submitted petitions to hold referenda to defederate from the CFS. While some of these petitions were received, others were not claimed upon delivery or were even returned to sender after being signed for. “One of our objectives was to hold the national executive accountable for this error, no matter how it came about, because it was a very grave error to miss students’ petitions and not deal with this issue,” said Brad Evoy, external commissioner of the GSU. “So we put forward a motion [at the AGM] to unseat the national chairperson.” The motion did not pass, but Evoy emphasizes that it was mainly an effort to get the federation to examine the unions’ grievances more carefully, and to try to push it toward reform. According to Alastair Woods, chair of the Canadian Federation of Students-Ontario (CFS-O), the CFS explained that the petitions were not received because of a clerical error. He added that the CFS has since received the petition from the Laurentian University Graduate Students’ Association. Woods emphasized that students risk their own interests if they seek to leave the CFS. Without the strength of numbers, Woods contended, it would be much more difficult for students to influence government. Woods further argued that conflict between student unions only makes it easier for governments to pass policy that is detrimental to the interests of young people and students. The GSU held its own AGM on November 25. At the meeting, the union passed motions to call on the CFS to abide by dates to hold referenda set in the petition. The union also passed an amendment to that motion, demanding that the federation replace Katherine Giroux-Bougard as Chief Returning Officer (CRO) for the referendum. Giroux-Bougard was chair of the CFS in 2009, and actively campaigned against defederation during her term. U of T, the GSU, and the CFS are currently discussing how the university can provide the CFS with student information so that it can verify the names on the defederation petition without compromising the privacy of the individuals on the list of students provided. 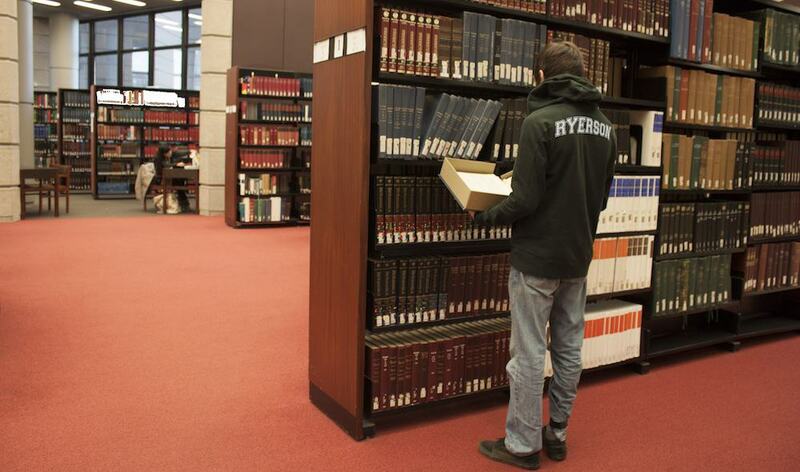 University of Toronto students have access to libraries across Canada with no extra fee. However, members of other universities must pay a flat fee to be able to borrow books from the U of T system. Under the Canadian University Reciprocal Borrowing Agreement (CURBA) — which was enacted in 2002 — students, faculty, and staff of participating universities are entitled to borrowing privileges at other university libraries. CURBA combines the resources of the four provincial university library councils, comprising 87 Canadian universities from all 10 provinces. In 2009, U of T introduced fees for direct borrowers, while still benefiting from CURBA. Students, faculty, and staff at all other Canadian universities must pay an annual $300 fee to access and borrow books from U of T libraries. U of T students are required to pay no additional fees to access other universities’ materials. Larry Alford, chief librarian at the University of Toronto, said that this fee agreement was necessary to maintain the university’s library system: “Our research library is one of the very best in North America, with only Harvard and Yale ranking above it. In order to maintain its quality, we — and that, of course, includes our students, through their fees — spend over $27 million a year on acquisitions alone.” U of T recently aquired the letters of General James Wolfe — a $1.5 million purchase paid for largely by Helmhorst Investments, a Toronto-based company. For Alford, the asymmetrical access to other libraries for U of T students is not a problem. “Our reciprocal [fee] agreements therefore ensure that students and faculty from other universities can share in our valuable resources, but that U of T students are not subsidizing this access,” he said. U of T currently has flat-fee agreements with other universities. Ryerson University, for example, currently pays $90,000 that allows its students to access a University of Toronto Libraries card. The card expires after one full year of access. There are other exceptions to CURBA in Toronto. The Ontario College of Art and Design (OCAD) allows access to its resources only to Ryerson University and York University, and the libraries at Ryerson and York lend to all other Canadian universities except U of T.
Cecile Farnum, Communications and Liaison Librarian at Ryerson, stated that this exception for U of T students was effective in the original 2002 agreement, even before the fee was charged. These exceptions do not mean that U of T students are completely unable to borrow books from these universities, or that students from other universities are unable to borrow books from U of T. The Ontario Council of University Libraries (OCUL) is one of the four provincial councils in CURBA, and ensures that all Ontario university students are unhindered by library politics. Students may request books in OCUL libraries through the Interlibrary Loan (ILL) using the Rapid Access to Collection by Electronic Requesting (RACER) service. These ILL RACER requests, however, take weeks to process and order without a $15 Urgent Request Form, making the loans accessible but untimely for many students. “Bell curving,” a statistical method that lumps student evaluations into pre-determined grade categories, is a common concern among U of T students. Under a bell curving scheme, course instructors choose an average grade, and then distribute class grades to get to that average; this means distributing a certain combination of A B C D and F letter grades. In most classes at U of T, the class average is around a C.
If a test is too difficult, or too easy, course instructors are permitted to calibrate class scores. This does not necessarily require a linear manipulation — such as adding the same number to each student’s test score — so calibration can theoretically result in grade distributions that look remarkably similar to a bell curve. When asked for comment on the calibration process, Althea Blackburn-Evans, the university’s acting director of media relations, said that calibration is necessary to ensure consistent application of grade standards across university units. “Assessments, particularly new or revised assessments, do require calibration and adjustment in terms of validity and reliability,” she said. To that end, it is not uncommon for course instructors to calibrate class scores that do not reach a certain average. Students in BIO120 had marks adjusted upwards by two per cent on a recent test. This adjusted the mean score from 64 per cent to 66 per cent. In a note posted to the Learning Portal after the test, Spencer Barrett and James Thomson noted that the mark adjustment was made to account for technical issues. “To produce a distribution more consistent with our long-term expectations, and to make some allowance for last-minute glitches with the DynamicBook textbook system and the audio recordings, we have added 2 percentage points to each student’s score,” the note read. Students in PSY201, a course taught by professor Ashley Waggoner Denton, also had marks adjusted upwards on a recent test. She states that the adjustment was made because the test took students longer to complete than anticipated. Arts and Science Students’ Union (ASSU) president Shawn Tian echoed Denis’s statement. 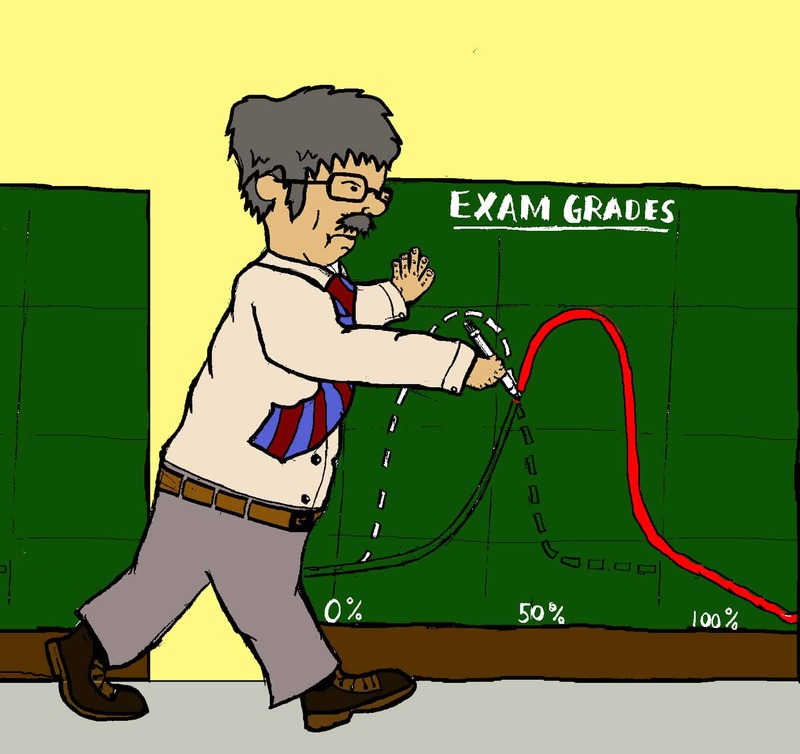 “When creating examinations, it’s difficult to gauge [precisely] how well a class will do,” said Tian, “so a bell curve after the fact may be inevitable due to some factor beyond the instructor’s control. This is especially likely when a professor needs to assess whether a new format for evaluation will be appropriate or not.” Tian also noted that he has never encountered instances of student grades being lowered after an evaluation. Mauricio Curbelo, president of the Engineering Society (EngSoc) commented on the reason test scores tend to be calibrated. “I think the biggest issue is evaluations which do not reflect the term work. This is what results in wide distributions of grades, requiring adjustment,” he said. Curbelo suggested that the university should make available to students past problem sets, tests, and exams to help avoid this problem. According to Blackburn-Evans, the university has a number of mechanisms in place to prevent the need for grade adjustments. She pointed to the university’s Centre for Teaching Support and Innovation as an example. The centre offers workshops on course design and assessment to course instructors. Blackburn-Evans also noted that assessment and grading practices are reviewed under the university’s cyclical eight-year review. The review is reported to the Ontario Universities Council on Quality Assurance, a provincial body responsible for ensuring the quality of all post-secondary educational programs. Correction: Ashely Waggoner Denton teaches PSY201 , not PSY220 as was incorrectly stated. 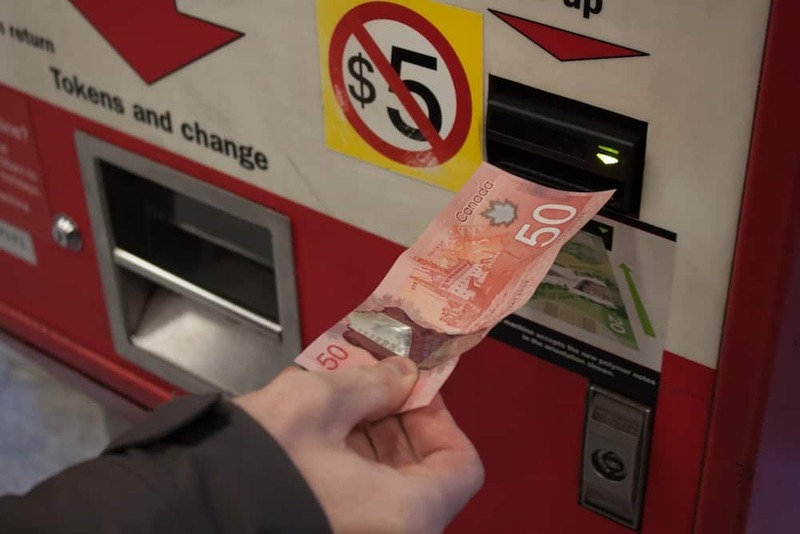 As the board of the Toronto Transit Commission (TTC) recently approved an increase in fares, the high cost of post-secondary Metropasses is a hot topic yet again. Come January 1, the TTC will raise the price of transit tokens and passes. Monthly passes for Toronto’s post-secondary students, already among the most expensive in Canada, will now cost $108, up $2. Illustrating just how expensive the TTC is, a student in Vancouver could buy three months of their city’s passes for the cost of riding a month on the TTC. Vancouver’s transit system charges post-secondary students $35 for monthly passes; students in Montreal pay only $45. Most other Canadian cities also have significantly cheaper monthly transit passes for students, including Calgary ($57.50), St. John’s ($61.25), and London ($70). Three years ago, CFS-O, with the help of student unions, launched the Fair Student Fares campaign, which successfully pushed Toronto’s City Council to create a discounted Metropass for post-secondary students. Although the pass is 19 per cent cheaper than an adult Metropass, the reduction pales in comparison to those in Vancouver and Montreal, where student passes are 72 per cent and 42 per cent cheaper, respectively, than their adult counterparts. The cost of Metropasses hits hard — four in five students at U of T’s St. George campus are commuters. Caitlin Morishita-Miki, of New College, takes the TTC to campus every day from Donlands station. The Metropass is the only option, she says, and without a better discount on post-secondary fares, she feels “backed into a corner.” For Morishita-Miki, like thousands of others, having to spend nearly $850 for eight months of Metropasses is a heavy burden. Universities in Ottawa have an unusual model. All students at Carleton University and the University of Ottawa receive a monthly transit pass, called the U-Pass. The pass costs $46 a month, and is a mandatory addition to student fees. High rates of participation in the popular program allow it to include greater numbers of students, and it therefore provides more leverage in negotiating with transit authorities. Despite being Canada’s busiest system, the TTC faces a unique funding challenge. With record ridership, the TTC will still have an operational shortfall of $6 million this year, even with the fare increase. The TTC is the least subsidized transit system in North America, receiving only $0.79 cents per rider from City Hall and nothing from the provincial or federal governments. The much smaller York Region Transit gets a whopping $4.49 per rider in subsidy. Transit systems in Vancouver and Montreal get subsidies of $1.62 and $1.16, respectively. Even New York City’s system receives $1.03 per passenger. Subsidies account for only 27 per cent of the TTC’s operating budget, with the rest collected at the fare box. Every other transit system in the Greater Toronto Area (GTA) gets more than half of its funding from government. In both Vancouver and Montreal, subsidies make up 46 per cent of operating budgets. Ontario Ministry of Transportation spokesman Bob Nichols emphasizes the province’s efforts to lower student fares on GO Transit and build new transit infrastructure in the GTA. However, he stresses that the province “is not involved in the daily operations of municipal transit services. Municipalities are responsible for all aspects of their operations, including the setting of fares.” He does not mention whether the province plans to provide a direct operational subsidy. Adding to the problem is the fact that students in the GTA often commute using different transit systems. While the TTC is the most popular, students also use the transit systems in Brampton, Mississauga, and York Region, as well as GO Transit. Meanwhile, students in Vancouver, Montreal and Ottawa generally use a single transit system, making the process of negotiating discounts much easier. With an eye toward further enhancing the affordability of transit, CFS-O recently launched a survey, titled “Students for Greater Transit Access,” to determine its next move. Woods calls the survey a “fact-finding mission,” gauging students’ views on the state of transit and expects that “a big piece of that will be talking about affordability issues.” The UTSU is also pursuing what Sajjad calls a “network of discounts” for students commuting from elsewhere in the GTA. While the UTSU is negotiating with provincial transportation authority Metrolinx about the possibility of a larger U-Pass covering all of Southern Ontario, a pass only for the TTC is not on the agenda. As students expect to pay even more for transit, affordability remains a problem for many of U of T’s commuters, lacking a cohesive solution.